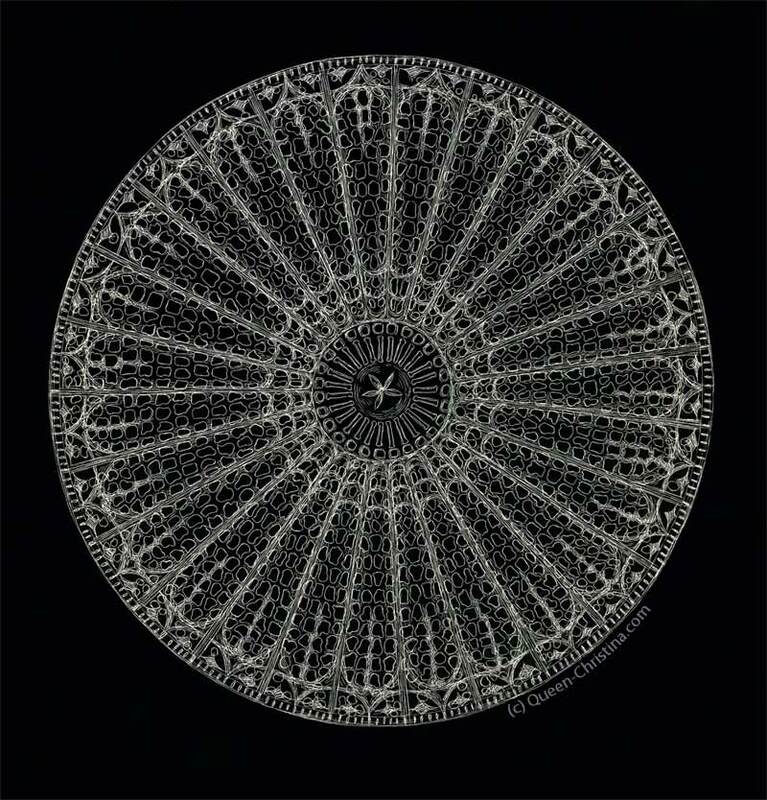 Cristina Brodie, Queen Cristina, created this beautiful drawing of a species of diatom known as Spider’s Web (Arachnoidiscus) and included it in her article posted on Microscopy UK entitled “Geometry and Pattern in Nature 3: The holes in radiolarian and diatom tests.” She created the drawing from slides supplied by Klaus Kemp and Brian Darnton. It very much takes on the appearance of a rose window, which just happens to be last week’s MotD theme. I love when that happens. The diatoms are one of the largest and ecologically most significant groups of organisms on Earth. They are also one of the easiest to recognize, because of their unique cell structure, silicified cell wall and life cycle. They occur almost everywhere that is adequately lit (because most species need light for photosynthesis) and wet – in oceans, lakes and rivers; marshes, fens and bogs; damp moss and rock faces; even on the feathers of some diving birds. Some have been captured by other organisms and live as endosymbionts, e.g. in dinoflagellates and foraminifera. Because of their abundance in marine plankton, especially in nutrient-rich areas of the world’s oceans, diatoms probably account for as much as 20% of global photosynthetic fixation of carbon (~ 20 Pg carbon fixed per year: Mann 1999), which is more than all the world’s tropical rainforests. Visit more of Cristina’s stunning botanical and natural history drawings and paintings: Queen-Christina.com. Once again we’re shown how much Mother Nature is both an artist and an inspiration for the making of art. As we go about our day today, take note and be inspired by the artistry of Mother Nature, even if it’s a dandelion making its way through a crack in the pavement. She definitely shows us her persistence in her creations despite any obstacles in her way.